Sunday, November 29, the day before the Paris Climate Talks begin. Today is a day of hope. 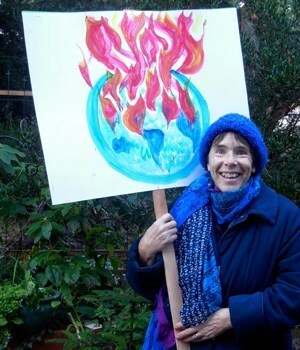 Today, I finish painting my placard of a burning planet and join our local Climate March. I don’t expect to change the world myself: a child of my acquaintance thought my first version of the burning planet was a jellyfish with tentacles, and “march” seems too vigorous a word for the friendly straggle of neighbours wandering down the streets of little Parksville. But all of us wanted to be part of a global call to our leaders to commit to solving the problems of climate change. So what does this have to do with TOK? How do we deal, in the IB Theory of Knowledge classroom, with arguably the most important issue of our times? How does TOK tackle climate change, and how does it connect, in so doing, with IB Creativity-Action-Service (CAS)? As I blog here on applying skills of critical thinking to current issues of our world, I would like to pause to draw a distinction between the roles of these two complementary parts of our IB education. Theory of Knowledge simply does NOT deal with issues in the world – at least, not as its subject matter. The role of TOK is to stand back as a commentator on knowledge – how it is created, tested, justified, and communicated. It teaches an overview awareness of how the different areas of knowledge work. It teaches thinking skills for awareness and analysis, so that students can filter and judge the best basis possible for their growing knowledge, and can be reflective in the process. However, thinking in a void is pretty useless, I’d say. We prepare skills to apply them – and I wouldn’t give TOK a single hour more of my life unless I thought we could, through our course, prepare students to navigate the world a little better. We give them practice in thinking critically as we examine, as the class presentation for IB assessment calls them, “real life situations”. Many TOK teachers and students will never deal in the classroom with refugees or climate change, my own current preoccupations, but all of us do seize on topics to use as examples for applied thinking. Climate change is a particular rich example – not just of how knowledge is constructed but also of the crucial importance of constructing it well! Clearly, almost every aspect of the world discussions on climate change bristles with knowledge questions: “How do they KNOW?” What is scientific methodology, what does it mean to say that scientists are “uncertain”, and why is likelihood often expressed as a percentage? What does “consensus” mean? What cognitive biases interfere with our intuitive grasp of issues around climate change? What should we understand about the role of images, statistics, and language in making knowledge claims? Aside from intuition and language, how do ways of knowing such as emotion, faith, and reason also interact to influence what conclusions we reach on climate change? How can we identify and assess reliable sources of knowledge amongst all those we encounter in the shared sphere around us? To what extent is knowledge that affects how we live — knowledge rife with implications! — created and communicated in a social context of economic interests and political ideologies, and how do perspectives within that context affect the knowledge claims? Does knowing bring responsibility for acting — and how do we know? But in TOK we don’t take action. That’s not our role. Our role is to think clearly so that any action we take is thoughtful and well based, from the justifications for knowledge claims to the ethical appraisal of possible actions one could take to follow the implications of knowledge. And there we stop. There, Creativity-Action-Service takes over, to give students experiential knowledge and develop their skills in different kinds of action. So today as I finished painting my placard and joined the quiet local Climate March, I wasn’t doing TOK. I was doing CAS. And right now, as I think back on the day’s experience, I suppose I’m doing both, as TOK and CAS meet in in their different forms of reflection.